Abuse of Power - Plain and simple. The President repeatedly misuses his position for corrupt purposes. His attempt to block a merger between Time Warner and AT&T had nothing to do with anti-trust policy, but because Time Warner owns CNN. In another instance, Trump berated his Postmaster General to arbitrarily raise the mailing rates on Amazon packages for no reason other than Amazon is owned by Bezos who also owns the Washington Post. This "Businessman-President" actively attacking businesses purely for spite, for connected entities exercising the First Amendment Right of a Free Press. This is not acceptable. This is not normal. It is an embarrassment that too many people support this buffoon who clearly has no redeeming qualities to hold the position that he holds. BTW Nixon had an enemies list for which he too attempted to use the levers of government to attack. It was Article II in the Articles of Impeachment - "repeatedly engaged in conduct violating the constitutional rights of citizens, impairing the due and proper administration of justice and the conduct of lawful inquiries, or contravening the laws governing agencies of the executive branch and the purposes of these agencies." In 1973, Richard Nixon resigned the presidency on the Watergate scandal. Members of Nixon's campaign hired CIA operatives to break into the Democratic offices in the Watergate Hotel to steal campaign information and improve his chances of re-election. The burglars were paid by the Committee to Re-Elect the President. The investigation revealed the conduct of the President's aides and friends - partially by the testimony of one of the members involved. The President was not connected to the original crime but participated in an extensive cover-up that involved abusing the power of his office for the corrupt purpose of obstructing an investigation into his associates (also tax fraud). Remember the truism, "History doesn't repeat, but it rhymes". Special Counsel Robert Mueller (and the press) have already uncovered multiple instances of members of the Trump Campaign meeting and coordinating with members of the Russian Government and Russian Intelligence. Those campaign members repeated lied about those interactions until the truth came out. Three high-level campaign staff met with Russian operatives in Trump Tower, close associate Roger Stone communicated with Russian Intelligence and Wikileaks to disseminate stole campaign information, and the candidate himself asked for Russian help on national TV while campaigning (Russia if you are listening...). This is the original crime greater than or equal to the break-in at the Watergate Hotel. Next comes the cover-up. As the investigations gained steam, the President asked the FBI director to lay-off of his friend and Director of National Intelligence who blatantly and willfully lied about his contacts with Russia. Then the President fired that FBI director admitting on national TV and to the Russian Ambassadors in the Oval Office that he did so because of the Russian Investigation. The President would proceed to berate his Attorney General for nothing other than recusing himself on matters related to Russia and later firing him to install an acting Attorney General with no qualifications other than his TV appearances attacking the Russian Investigation. On multiple occasions, the President has attempted to fire the Special Counsel only to be saved from himself by his staff. He has however, fired the investigators including the FBI director, the entire top level administration of the FBI and the attorney general. And finally, he routinely attempts to intimidate the witnesses against him. The President has openly and brazenly attempted to obstruct the investigation into his campaign's numerous connections to the Russian government and into his own actions. This is the story that will be told in the history books next to the story of Watergate. Even in 1973, Richard Nixon enjoyed popular support throughout the investigation until his voice was discovered on tape participating in the cover-up. Now, the President abuses his power in plain site. His voice is on video tape participating in the cover-up and even the original crime. This is a long and complex story, difficult to follow even if you are paying attention even worse if you only watch Fox News. But what side of history do you wish to be on? The side that protects the Rule of Law and believes that no-one is above the law, including the President? Do you believe the President has unlimited power, like a modern American King, or did we design a Constitution to prevent these abuses of power that no-one should be trusted to maintain? For one final thought, imagine the shoe on the other foot. It's not a hard choice. Trust me, I don't want Mike Pence to become President either, but to protect the Rule of Law and our American Institutions, he should be President as soon as possible. He will do similar damage to consumer protects, civil rights and continue to actively strip Americans of access to health care. But he will be less embarrassing on the world stage. He won't bow to the Russian President, cozy up with the murderous Saudi Prince, or make the same mistakes the a North Korean dictator. He's a bland Gerald Ford, but he is what America needs to break this fever. Sooner rather than later. These are not the words of an intelligent person. These are the ramblings from the class presentation of the D-student that thinks he’s smarter than the rest of the class, including the teacher but he never studied the topic for the speech because he could just wing it (source: I was a teacher). If you actually take the time to learn about the climate and the massive amount of evidence that it is indeed changing and that we, humans are the cause, then you can and will understand climate change. No one can actually look at the empirical data and come to a different conclusion. The deniers depend on buzzwords and confusion to to keep you ignorant. Learn, ask questions and maybe we can still do some good. Be good stewards of the Earth. We cleaned our air and water with science based regulations (also addressed the hole in the ozone layer). Trash in the ocean is an unrelated but actually important topic. The ten hottest years in record have all been in the like last 12 years. The universe will probably die a heat death in a few billion years, but again it is completely unrelated to the topic at hand. 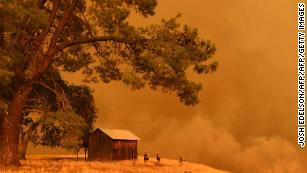 People do not actually take the forest floor, but the droughts affecting California are most likely caused by climate change (also most forest management in California is run by the Federal government, of which he is the boss, or private companies). Experts vs Dumbasses - Who Should We Listen Too? One of my new favorite tweets. Should we listen to people speaking out of their butts OR should we listen to people that actually know some stuff? I think its a pretty easy choice! But to be serious. The people that don't "believe" in climate change are always people that don't understand climate change. They really don't. It's the same with evolution. People that don't "believe" it, have no real understanding of the concept. It may work slowly, but the best antidote to climate change denial is education. Sharing the facts, explaining the impact on our environment AND our economy AND our national security. It's a big deal that we are doing very little about. That can only change by electing legislatures that will actually listen and understand expert testimony. The US government has come to the conclusion that there is "no convincing alternative explanation" for climate change other than "human activities, especially emissions of greenhouse gases." This echos the statements of every climate scientist on the planet (97%). The second volume was released today, as the Trump administration attempts to bury this news in Black Friday shopping, hoping that you won't notice. The latest volume paints not only a devastating picture for the planet that your children will have to grow up in, but also the lasting damage to the US economy. Billions of dollars will be lost each year, the Southeast US (that's us in NC) will lose 500,000,000 hours of labor due to intense heat - look at the lost productivity from two massive hurricanes just this year. Farmers facing extreme temperatures, droughts with flash floods will struggle to produce corn and soybeans. Heat exhaustion can affect dairy production and red tides will affect fishing economies. We can expect extreme changes to our health care as well. Warmer temperatures means more mosquitos and ticks - Zika, West Nile. Kids will allergies and asthma will suffer more exacerbations. The Department of Defense recognizes the risk to national security posed by Climate Change even if the Republican party continues to bury its collective head in the sand. The GOP's ignorance of climate change will hurt America - hurt our environment, hurt our economy, hurt our children and hurt our security. Glossing over a well-researched report seems par for the course. The Republican party will never actually help America or Americans, it will only help its donors. This meme passed through my Facebook feed before disappearing into the deep abyss. Rather than search for my friends post destroy it on there, I figured I could just answer more broadly here. 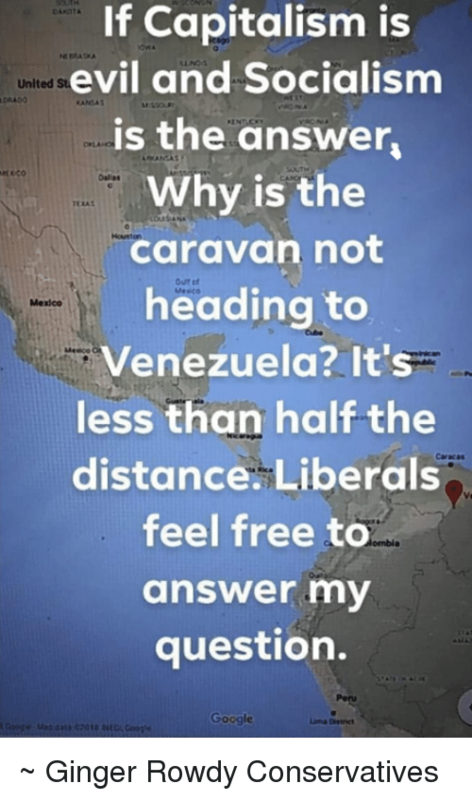 The question posed, “if capitalism is evil and socialism good why isn’t the migrant caravan headed to Venezuela?” As it asked for a liberal to answer, I shall give it my best shot. Capitalism is the best economic system that we have, providing great incentives for effort, ingenuity, and innovation. But we must acknowledge that pure capitalism can seem pretty evil. It can abuse the employees and dupe unsuspecting customers. That is why we have regulations. We regulate restaurants to prevent them from serving dirty food from unsanitary kitchens. The customer has little view of the back of the store and without those regulations hundreds of people could become sick and die before finding the source. We regulate polluters ability to destroy the local environment as the consumers have the little ability to make an educated choice about a company's environmental impact. We also prevent monopolies from hijacking the market without competition, forcing out potential rivals, driving up prices and driving down wages. Every Walmart appears to be a shrine to capitalism, which has driven out local mom-and-pop stores and continues to pay criminally low wages as workers must rely on welfare and food stamps. If Walmart paid their employees a living wage, we could probably cut those budget items in half. So while capitalism provides the opportunity to growth and new ideas, we must admit that there needs to be constraints. If you disagree with the previous paragraph, think about the following question: Have you ever felt screwed over by a company as a customer or as an employee? That is why we need regulations. Likewise, socialism has both good and bad. Generally, dictators use the language of populism to obtain power, hiding their fascist tendencies behind a veil of socialist agendas. If you immediately express your contempt for socialism, I have some more questions for you to consider. Do you respect firefighters and police officers? We can agree that they are a social good, paid for by tax dollars instead of dues. Are you expecting to receive Social security and Medicare? Also examples of successful socialist programs. You pay taxes through out your life and receive the benefit later on. Those are all socialist programs even if you don't want to believe it. The meme that I saw [all memes really], lacks the subtlety of modern life. To simply say that capitalism or socialism is always good or always bad misses the nuance. The people that share this picture on Facebook always point to Venezuela and conveniently forget the balance of capitalism and socialism that we have here in the United States. It's the balance between these two economic systems which has made America great, propelling us to being the world's great superpower.